Continuing Education offers non-credit courses and contract training that increases knowledge, skills, job productivity and career potential. With Continuing Education courses, you don't earn traditional college credit, but you may earn CEUs (continuing education units), certifications and licensure within various professional education programs. Course registrations are managed through an online registration system that allows you to search and register for courses. You can also download and browse a PDF version of our printed catalog, which is mailed to area households each term. Be sure to register online for your CE class early. Space may be limited, and your space is reserved only after your registration fee is received. An acknowledgement of registration and payment will be emailed to you after your registration is received. If you set up online access with Continuing Education Registration, you may also access your schedule online. If you're taking a course to earn a certificate or contact hour credit, you are expected to attend each program in its entirety. Credit for partial attendance is allowed only in emergency situations; contact hours will be rounded to the nearest half hour actually attended. Certificates are be awarded at the close of each program. Certificates must be picked up personally. After you complete your course, you can request an official record of your non-credit coursework. For Continuing Education courses where certificates are awarded, you will receive your certificate upon successful completion of the program. 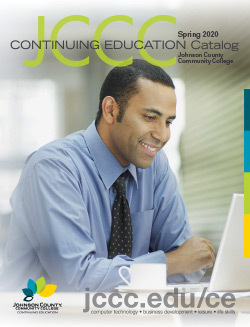 Continuing Education fees are subject to the JCCC Tuition Refund Policy 312.01. There is plenty of parking on campus, and it's free. Do allow ample time to find a spot because campus can be busy, and you may have to park a distance from your classroom. Room temperatures vary, so it's advisable to dress in layers.